Located in the IDA Business Park right beside the Waterford Institute of Technology, this business space offers the perfect setting for entrepreneurs to focus on the growth and development of their business. Workspaces are designed with your comfort and convenient in mind, offering contemporary and innovative environments. You will have 24 hour building access so you can work around the clock and high speed internet. The centre also offers front desk services, access to meeting rooms, member events. This modern centre is featured within a sleek, glass fronted building. A wide range of useful services available including serviced meeting rooms, recreational areas and a dedicated reception service. The building is accessible 24-hours a day, as well as providing tenants with high-speed internet, copy & printing facilities and conferencing services. In addition, the area is close to several bus and coach stations, allowing for easy access around the city itself. The Airport is also a short 20-minute drive away. In the surrounding areas, local amenities can be found in abundance - including restaurants, retail outlets, cafes and supermarkets. 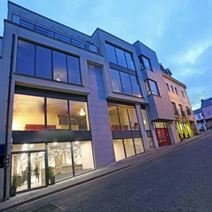 A stunning centre situated in Waterford, providing many professional services to assist your developing business. Tenants can benefit from the meeting rooms, high-speed WiFi and break-out lounge areas. The office building is also accessible 24-hours a day and all work-spaces maintain great levels of natural light throughout the day. In addition, the centre is well situated close to plenty of local amenities and services including cinema, retail outlets, restaurants and bars. The transport links surrounding the office-spaces are numerous as well, with easy road, rail and air links.